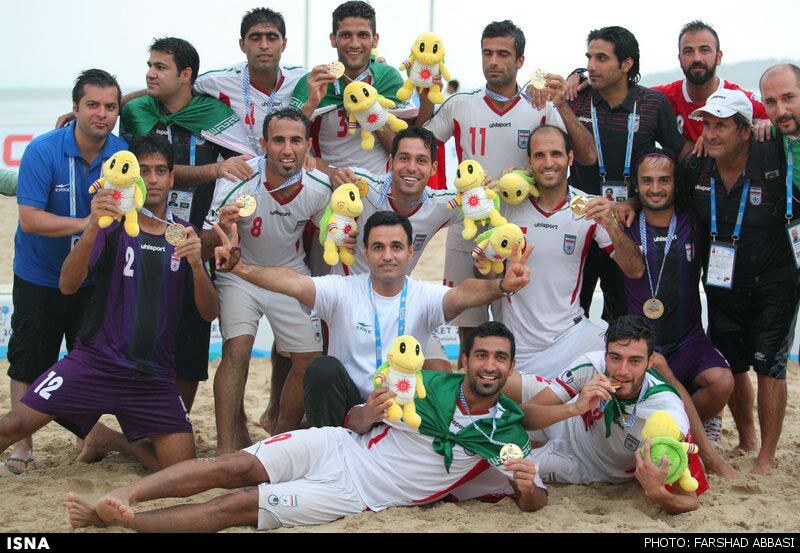 Iran's beach soccer team defeated Japan 4-3 and won the gold medal in the 4th edition of the Asian Beach Games on Friday. Shahriar Mozhdeh Roudsari, Ali Naderi, Amir Hossein Akbari and Hassan Abdollahi scored for the Iranian outfit at the Saphan Hin. Moreira Ozu (twice) and Takasuke Goto scored for the Japanese team. In the bronze medal match, the UAE demolished Vietnam 8-2. Iran has already won five gold medals in the games which is underway in Phuket, Thailand. Kamran Hosseini Jam at the Men's Freestyle -80kg, Mohammad Naderi in the Men's Freestyle -70, Jaber Sadeghzadeh in the Men's Freestyle +80kg, kurash athlete Ghanbar Ali Ghanbari in the Men's -66kg and Sobhan Taherkhani n the Men's Long Jump Final have previously seized the gold medal in the games. The 4th Asian Beach Games opened in Thailand on November 14, attracting 3,272 athletes from 43 Asian countries and territories. There are a total of 196 categories in 26 sports. The Iranian athletes are competing in 17 out of 26 sports in the event. The first Asian Beach Games was held in Indonesia in 2008. Vietnam will host the fifth edition in Khanh Hoa Province and Da Nang City in 2016.